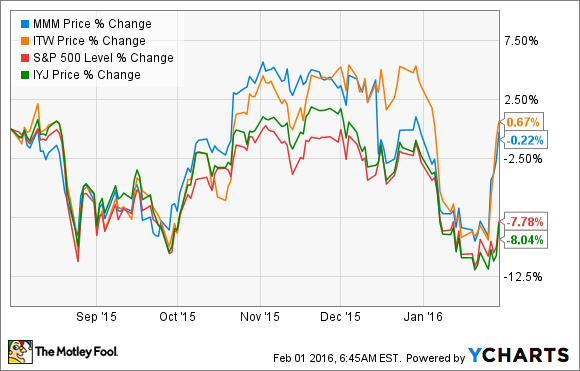 Better Buy: Illinois Tool Works or 3M Company? These industrial companies reported better than expected results and have good underlying prospects. But are either worth buying? Illinois Tool Works (NYSE: ITW) and 3M Company (NYSE: MMM) both delivered solid fourth-quarter earnings recently, and maintained their full-year guidance for 2016. Given the deterioration in the economy in the fourth-quarter that's no mean feat. As a consequence both stocks are now outperforming the S&P 500 and the industrials sector -- measured in this case by the IShares US Industrials (NYSEMKT: IYJ) ETF. Does this make the stocks a buy? End markets set to bounce? As you can see in the chart below, U.S. industrial production has contracted in recent months, but Illinois Tool Works gave some tentative looking commentary that suggested that the bottom could be in sight. In its most-cyclical businesses -- welding, and test and measurement -- Illinois Tool Works CFO Michael Larsen outlined how sequential growth was better than expected. "In simple terms, based on typical seasonality, you would expect these businesses to be down 2% sequentially, but they were actually up 2%," he said. "It may be too early to call this a trend, but certainly, an encouraging data point as we look ahead." Is this a sign of a turnaround in progress? I don't know how Illinois Tool Works seasonally adjusts its figures, so I decided to check against what 3M Company reported. 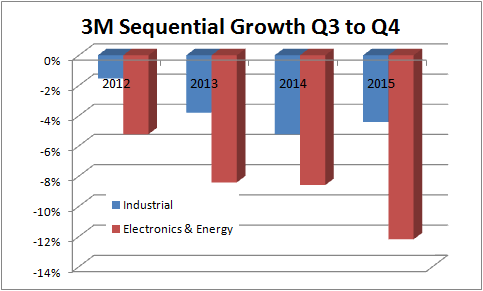 A simple analysis of 3M Company's most-cyclical segments reveals that sequential growth in its industrial segment doesn't compare particularly favorably with previous years. Europe picking up the slack? While the evidence of a bottoming in industrial conditions isn't compelling, it appears Europe is helping out. 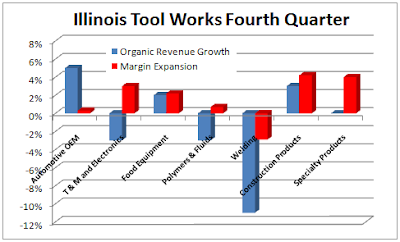 Illinois Tool Works' fourth-quarter organic revenue shrank 0.6%, with North America down 1.6%, but the EMEA region (Europe, Middle East and Africa) produced a 1.9% increase. It was a similar story with 3M, where organic local currency sales fell 1.1% in the fourth-quarter, while the U.S. was down 0.4% and the EMEA region increased 1.1%. The weaker euro will obviously hurt U.S. dollar revenue (after taking a 11.7% hit from foreign currency effects, 3M's EMEA sales were down 8.8%), but at least it's evidence of some growth in the global economy. Illinois Tool Works says 60% of its revenue comes from consumer-facing businesses, and management outlined how those produced 3% year-over-year growth in the fourth-quarter compared to a negative 6% for its industrial-facing businesses. That has been a recurring theme in the industrial sector in recent quarters, with areas like automotive and food equipment producing organic growth, while weakness characterized the industrial-facing businesses. The theme was repeated in 3M's fourth quarter: Its industrial segment saw organic local currency revenues shrink by 1.8%, but its consumer and healthcare segments recorded 2.7% and 4.5% growth, respectively. Both companies are well run, and have been streamlining their operations while jettisoning underperforming businesses. As a consequence, both produced underlying margin expansions despite falling revenue. After adjusting for restructuring, 3M's operating margin increased to 22.1% from 21.5% in last year's fourth quarter. Meanwhile, Illinois Tool Works' operating margin of 20.7% in the fourth quarter was up from 19.6% a year earlier. CEO Scott Santi outlined his expectation that operating margins would grow by 100 basis points (1%) in 2016 and again in 2017 due to its five-year enterprise strategy. Turning to valuation concerns, on a forward enterprise value (market cap plus net debt) to earnings before interest, tax, depreciation and amortization (EBITDA), Illinois Tool Works looks a better value. 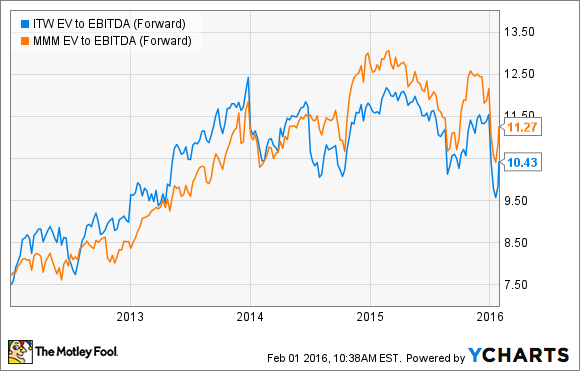 Between these two companies, Illinois Tool Works appears to offer investors the better value. Illinois' announced initiatives also look set to improve operating margins in the future -- setting the company up to leverage any upturn in its end markets. However, I have concerns. The case for a bottoming in its end markets isn't a convincing one, and the automotive sector (18.9% of 2015 revenue and a consumer-facing business) has some uncertainty around it in 2016. Relying on it for growth might prove a mistake. Meanwhile, even if Europe is growing because of a weaker currency, then U.S. companies will take a hit to earnings upon translation. Illinois Tool Works is a better buy, but in my opinion, its valuation is still not compelling enough for investors to buy in until there are clear signs of stability in the industrial sector. Where Will Illinois Tool Works Be in 5 Years?